In the last few years a new dance and fitness craze has swept through our nation, and this new dance-fitness program is called Zumba. But what exactly is Zumba, why has it become so popular and can it really help you to lose weight? 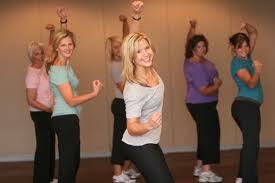 Zumba is an aerobic fitness workout that combines Latin dance with vibrant music. The music changes rhythm during a session to give you a total body workout. Dancing to fast paced music will obviously provide a cardiovascular workout that raises your heart rate and burns plenty of calories, while the slower music numbers allow you to focus on movement, stretching and flexibility. Zumba has become very popular in the last few years, but its roots can be traced back to one fateful day in the mid 1990's when Zumba was created by accident! A fitness instructor from Columbia called Alberto Perez turned up to take an aerobics class without his regular backing tape. He did however find a tape in his bag which was full of the Latin dance music he loved. The class loved working out to the energetic music (letting themselves be guided by the music) and Zumba was born, Alberto was then inspired on to design a fitness program built around Latin music and dance, Zumba was born. Today it is practised in over 100 countries in around 100 000 locations. A lot of people struggle to exercise on a regular basis, finding it rather boring and a bit of a chore. if you don't enjoy doing something, then it is very difficult to stay motivated to keep doing it on a regular basis. If your long term goal is to lose weight and keep it off, then exercise needs to be a regular part of your lifestyle. The secret to Zumba's success and the reasons why it is so popular, is down to the fact it is a really energetic fat burning exercise workout and it is a lot of fun. Its an energetic and fast-paced cardiovascular workout. You can burn over 500 calories an hour. Great way to meet new friends through attending classes. It can be done at home with a DVD. It provides a full body workout that uses lots of different muscle groups. Tones muscles and improves flexibility. It may even improve your dancing! Three sessions of Zumba a week will turn you into a lean, mean grooving machine, use Zumba for weight loss and have a great time while you are doing it. Would you like to learn how to lose weight fast and keep it off? Maybe you are looking to lose the beer gut or lose weight after pregnancy then I can help. My online weight loss resource offers you the opportunity to sign up for free weight loss tips. Learn the secrets to rapid safe weight loss and change your relationship with food forever. Take the first steps today to losing weight and feeling great.